Congratulations to Lorraine of Sutherland, who is the winner of the first weekly prize draw for Summer Reading Club 2012-2013. 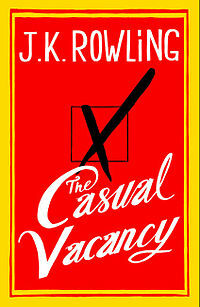 Lorraine read "The Casual Vacancy" by J.K Rowling. An enjoyable read, believable characters, good plot-most characters quite unlikeable. Read more...A well written and clever book- an adult novel of people all wanting to be "top dog" in the council- all have their own agendas. Many characters, this causes lots of confusion, husbands, wives and children-everyone is at war with each other. It's hard to see who will come out at the top in the end; or who will be the worst trouble maker. A clever plot with twists and turns, a fairly long read that keeps you wanting to know more. Surprise ending. But this is not a memorable story. There are no sympathetic characters. Why not borrow a book (or audiobook) from the library and fill in an Adult Summer Reading Club entry form for your chance to win one of the great weekly prizes, and the chance to win an e-reader. The more you read, the more chances you have to win. Just drop your entry form (with a book review) into a Summer Reading Club Entry Box, there is one at every branch of Sutherland Shire Library Service. All the family, adults, teens and kids are invited to get reading this summer by joining our Summer Reading Clubs.